This may just be the simplest sensory bin I’ve ever thrown together. I wanted something that could help reinforce some of what we are learning about nutrition and that wouldn’t be messy so I chose not to use real food (other than the dried beans). When we were vacationing on Vancouver Island last summer, I picked up a lot of these fruits and vegetables at this cute store that has live goats on the roof! I knew that they would come in handy for play and have been wanting to use them in a sensory bin. For the sensory bin, I used dried beans as the base and added some of our play food including the very life-like food that I bought last summer. I used some felt food like the cheese and bread and tomato slice to add different textures. The food includes squash, onion, peppers, eggplant, cheese, avocado, bread, tomatoes, cucumber, grapes, and lettuce. I didn’t have any play meat. I guess it’s more of a vegetarian sensory bin! 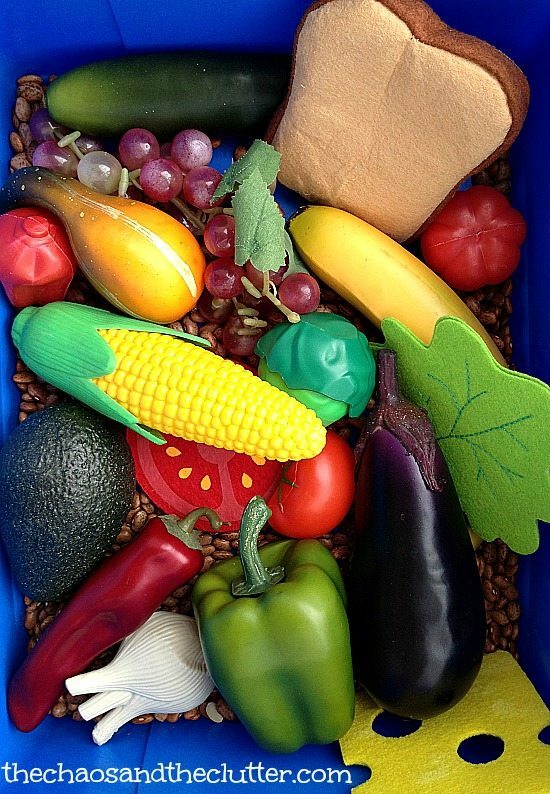 You can create a similar sensory bin using whatever play food you have and use it to spur on a discussion about what foods are healthy. I also have some play ice cream and cookies and donuts so I will be adding those to the bin on another day and asking the kids to separate the foods into healthy eat whenever foods versus treats and only eat occasionally foods. I’m thinking that I will add a real banana and real green pepper since I have some and I want to see how quickly the kids notice! This is awesome! I really should set up a sensory bin for my son again soon, but lately he hasn’t been too interested. I bet if I added a real banana like you suggested, he’d be pretty excited about it though! That’s such a cute idea! We haven’t delved into the fake food yet but I bet my kids would like this.